And the Schengen flag too? 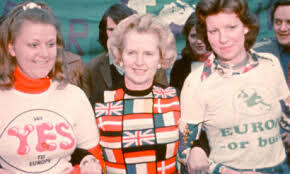 It is a bit of understatement to say that Margaret Thatcher was no Schengen fan. In her vitriolic attacks on ‘Europe’ as a political project, she did not spare what she believed was an unnerving and ultimately quixotic quest to dilute, and ultimately dissolve, British sovereignty, a quest concocted by naive continentals, or worse still, by faceless bureaucrats in Brussels. As she put it in the notorious ‘Bruges Speech’, the political manifesto of British Euro-scepticism, “it is a matter of plain common sense that we cannot totally abolish frontier controls if we are also to protect our citizens from crime and stop the movement of drugs, of terrorists and of illegal immigrants.” Commonsensical are also the reasons why national borders should persist: “I did not join Europe to have free movement of terrorists, criminals, drugs, plant and animal diseases and rabies, and illegal migrants”. (Certainly not the Europe of peace and goodwill that Jean Monnet envisioned…) In Thatcher’s ‘commonsensical world’, the triad borders/security/state is so ingrained in our collective understanding of what border control means as to not require further explanation. Borders and security are indissolubly linked, and national governments (as opposed to supra-national institutions) should be in charge of this issue. From this perspective, Schengen can only be an aberration.